EUR tried to keep its power against USD from yesterday’s close. There are no major economic reports in Eurozone therefore eyes will be on the US existing home sales data. 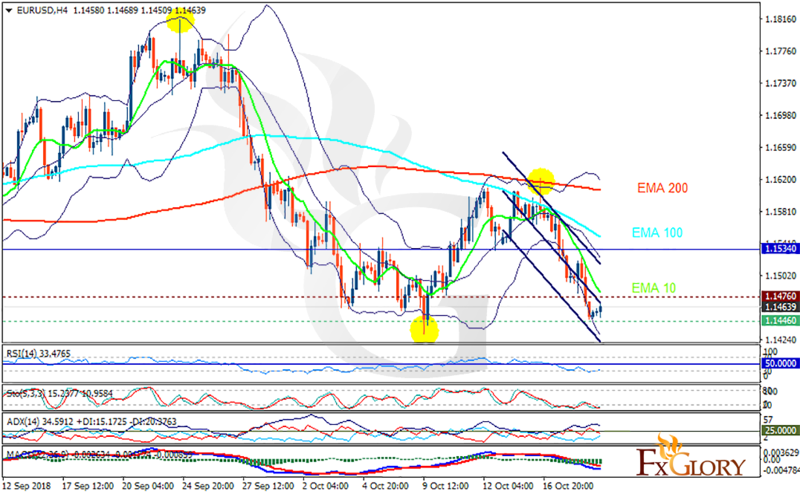 The support rests at 1.14460 with resistance at 1.14760 which both lines are below the weekly pivot point at 1.15340. The EMA of 10 is moving with bearish bias in the descendant channel and it is below the EMA of 200 and the EMA of 100. The RSI is moving in the oversold area, the Stochastic is moving in low ranges and the MACD line is below the signal line in the negative territory. The ADX is not showing any clear signals. The pair may decline towards 1.143 but then it will grow towards the upper Bollinger band at 1.16.